Andrew Stubbs is making the most of his second chance. After failing a first-year required course at Laurier’s Lazaridis School of Business and Economics due to an excess of partying and a deficit of study and sleep, he decided to make some changes. Big changes. In his search for a better-balanced life, Stubbs cut back on the parties, started meditating, ate healthier, prioritized sleep and sought ways to study more effectively. And when he retook that problematic first-year course, he got a perfect 12. Now he wants to help other students make a similar turnaround in their lives. 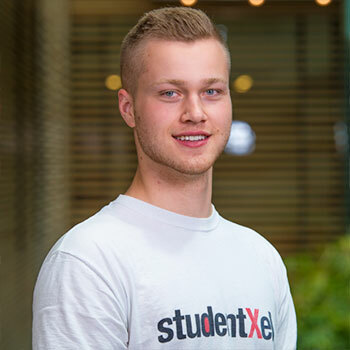 Stubbs, currently in third year of the Lazaridis BBA program, is the founder of studentXel, a lifestyle company aimed at showing university students how to bring balance to their often-chaotic lives. To conquer exam stress, one of the biggest sources of student anxiety and bad habits, he developed studentXel’s feature product: Klarity™. It’s a Health Canada-approved proprietary mixture of natural health supplements in pill-form designed to provide students with the ‘calm focus’ they need to make the most of their study time. We sat down with 20-year-old Stubbs to find out more about the beginnings of Klarity™, his entrepreneurial vision and the role the Lazaridis School played in bringing it to life. Q: Let’s hear the origin story of your business. Andrew Stubbs (AS): I was living in residence at Laurier in first year and a lot of students seemed completely overwhelmed by the stress of exams. Some of them were even taking prescription drugs from friends and roommates to help them study. I remember a friend of mine got a hold of Dexedrine [a stimulant prescribed for ADHD] and used it to stay up all night studying. The next day he looked absolutely delirious. I figured there had to be a safer way to provide students with a reliable study aid that didn’t involve black market pills. The answer was Klarity™. Q: What exactly is Klarity™? AS: I like to think I’ve found the Holy Grail combination of caffeine and L-Theanine, a relaxant found in tea. This gives you the focus and alertness you want from caffeine, but without any of the jitters or crashing afterwards. Then we added some beneficial vitamins and other ingredients to improve one’s mood, decrease stress and help send more nutrients to the brain. The result is a pill that’s perfectly safe and approved by Health Canada, and provides students with the calm focus they need to tackle the books. Q: So is the message that students can find success by taking your pill instead of some other pill? AS: Not exactly. Klarity™ is just one part of studentXel. Equally important is what I call the studentXel LifeCode. On our website (www.studentxel.com) you’ll find a lot of information about how to live a balanced lifestyle: meditation, healthy eating, exercise etc. University students talk about the triangle of life: everyone wants to get good grades, have a social life and sleep – the catch is you can only pick two. I want to show students they can have all three; you can prioritize sleep, be social and get good marks. But to do this your study periods need to be effective, precise and optimized. And that’s where Klarity™ comes in. Consuming a dose before studying helps you feel centred and relaxed, which puts you in the proper state of mind for retaining information. Q: Get a good night’s sleep. Don’t drink too much. Study hard. It’s great advice, but probably every parent has said the same thing to every son or daughter as they dropped them off during frosh week – only to have it ignored the moment they drove away. How can studentXel get university students to appreciate a well-balanced life when mom and dad have been trying, and failing, to do the same thing for generations? AS: What first-year student is going to listen to their parents? (Laughs) But when it’s a peer talking to you − or showing you − I think there’s a much better chance for success. Students can have a huge impact on each other, and with studentXel we’re trying to make healthy living cool again. Our goal is to reinforce good advice by delivering it from a student’s perspective. Everybody knows they shouldn’t be going to bed at 4 a.m. and getting up at 7 a.m. I’m certainly not saying you should cut out partying or give up on a social life. But getting wasted every weeknight? That doesn’t make any sense. The LifeCode provides direction and offers habits that will improve your mood and make you a happier person and a better student. Q: So the pill and the LifeCode work together? AS: StudentXel is designed as a movement, or a lifestyle if you prefer. And we back up that advice with a product. The reason I chose to make Klarity™ a pill, rather than a drink or a chewable candy is that kids today are familiar with pills. They trust them. It’s part of their routine. And that makes Klarity™ a safer alternative to other pills they might be tempted to take. It also fits into the growing interest in nootropics, or smart drugs, and overall healthy living. Q: Take us through the creation of Klarity™. AS: When I realized that there was nothing on the market tailored to students as a study aid, I started my own research into supplements and what they can do for you. Then, with $20,000 in seed financing, I reached out to a professional compounder and we looked at many different formulations. With myself, my peers and other people in the supplement industry, we eventually refined it into the product we have today. After that Health Canada gave us an NPN, or natural product number, which allows us to retail it in stores in Canada. AS: We’re continuing to roll out Klarity™ on campuses across the country. It’s currently available at Laurier, University of Waterloo, Queen’s, Western, Guelph and Toronto, as well as select health food stores and online sales. We also trying to grow our social media presence. And while I’m focused on the student market right now, I can ultimately see this moving beyond universities to offer greater focus and success to everyone wherever they are: work, home or school. Q: How crucial has Laurier’s Lazaridis School of Business and Economics been in getting studentXel off the ground? AS: If I didn’t go to Laurier, I wouldn’t have known where to start on this journey. Everyone I’ve talked to – from profs to students − has been extremely supportive and many have offered to help. It’s such a tight knit group here. Everyone knows each other and helps each other out. There’s been so many opportunities. Last year, for example, my company was the subject of a group case study in the second-year entrepreneurship course. I met with the students several times over the term, they did their own research and then wrote up several reports and presented their suggestions for the business. That was really helpful; it was like having another set of eyes look over my company. The Advertising Project [a student-run club] also took on my firm as a case study. Again, I got great recommendations. And I’m in the midst of partnering with Students Offering Support to make Klarity™ available during their exam study sessions and on their website. Plus, through a connection provided by professor Laura Allan I’ve gotten mentorship advice from Laurier grad Matt Schnarr, founder of AWAKE Chocolate, the caffeinated chocolate bars. I like to think of Laurier as a small school, but with a very big outlook. Q: You sound very busy. So how much sleep did you really get last night? AS: Last night? About 10 hours. I’ve got so much to do, I can’t afford to be tired all the time.